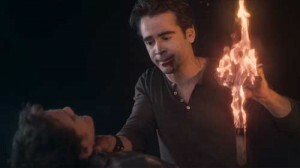 A remake of the 1985 movie of the same name, 2011’s Fright Night stars Colin Farrell (Horrible Bosses) as the vampire who lives next door. Ferrell’s identity is discovered by high school senior Charley Brewster (Anton Yelchin, Star Trek), who’s having fun running with the popular crowd and dating the most coveted girl in school, Amy (Imogen Poots, Jane Eyre). When their classmates start disappearing and Charley suspects his nice guy neighbor Jerry (Farrell), nobody believes him — of course — not even his mom (Toni Collette, TV’s United States of Tara). Doctor Who‘s David Tennant also stars in the film, which was directed by Craig Gillespie (Lars and the Real Girl). Sounds like it’s one to check out on disc. Disney‘s three home entertainment version are packed with special features, as well as the downloads.